This is an original color film lobby card for the official movie of the 1953 first ascent of Nanga Parbat, NANGA PARBAT 1953 -- DER ERSTE FILM DER DEUTSCH-ÖSTERREICHISCHEN HIMALAYA-EXPEDITION 1953 filmed, directed, and edited by Hans Ertl. This is not a modern copy. It is original and dates from the time of the original 1950s release of the film. The paper measures 296mm tall x 209mm (11.75 inches x 8.25 inches) with the printed color image measuring 285mm tall x 188mm. 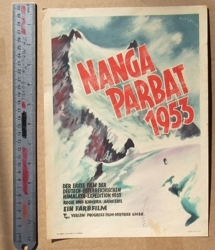 This poster is for the film of the expedition where Hermann Buhl made the dramatic solo first ascent of Nanga Parbat. It is the smaller version lobby card. There was a larger full size poster version produced at the same time (different artwork on it) that is nearly impossible to find outside of museums. CONDITION: Original printing/issue from the time of the film's initial release in the 1950s. The card is on relatively thin paper (not cardboard) which resulted in very few of these posters surviving in nice condition. 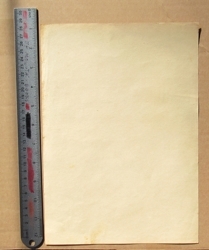 This example is in clean, bright condition, with a clean 7mm tear and a clean 3mm tear front right margin (not into image), a clean 4mm tear left front margin (not into image), no folds, a small area of light foxing in the lower portion, and very minor corner wear. This item is very uncommon in any condition. This is the best condition example that we have encountered. Price: $125.